I struggle with really internalizing probabilistic thinking, especially when trading live. I can understand the math and the reasoning–I’m a freaking rocket scientist after all. However, a rocket scientist is trained to NEVER be wrong. A trader must be trained to be “wrong” quickly and relatively often, and accept it and move on with their system. Staring a loss in the face (or even worse a string of losses) shakes your ability to believe in it. You doubt your system, and you doubt yourself, and that’s when impulsive revenge trades can come in and you blow yourself up. It takes practice to overcome your emotions, at least for me. Assuming that you have researched a strategy, know when it should work and when it doesn’t, and are consistent in applying it, if you stick with your plan then the law of large numbers can come into play and your edge can pay off. But how do you know if the edge has changed? If you usually win 70% of the time, but start to win only about 30% for a few days, do you pack it in, or keep going? What if you start a new system? 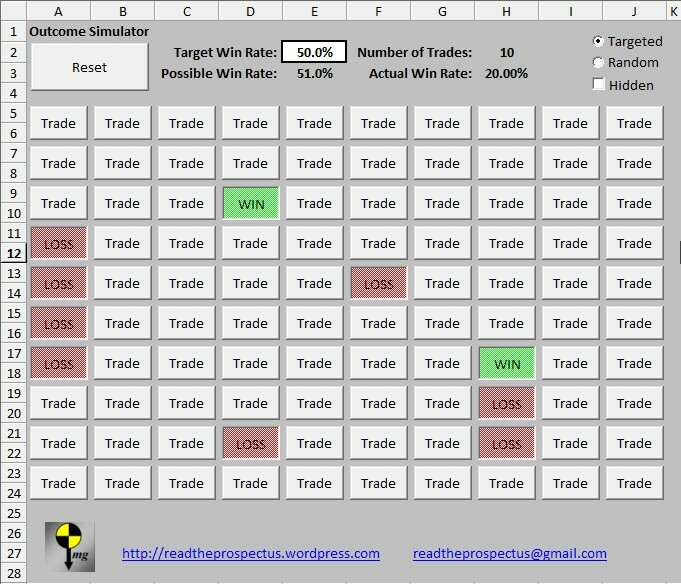 How many trades are enough for your hoped-for edge to show up in your outcomes? How many are too few to call it quits? 2. Random distribution–this mode creates a distribution at random between 0% wins and 100% wins. You can then see how the realized outcomes roll in with those kinds of rates. 3. Hidden distribution–In this mode, a distribution is chosen either targeted or at random, but it is hidden from you (targeted is kind of pointless running hidden, since you put in the number, but oh well). You could be looking at a net winning set, or a net losing set. Click to see outcomes, and try to decide from those if it’s a winner or a loser distribution. Then click the “show” button to pretend that you are quitting trading, and to see what the actual distribution was. When you click show, if the true distribution was below your actual results, then you made the right call, and quit while you were ahead of the possible. Even if you were a net loser on outcomes, if you did better than the true distribution you made the right decision to stop! Conversely, if you were a net winner, but the true distribution was better than your outcomes, you should have kept pressing. It was the wrong decision to quit. You should begin to learn to value the rightness of a decision based on what you knew at the time and in aggregate rather than what the individual outcomes of each “trade” are. It can also tell you a lot about yourself. If you have a run of 5 losses, do you get impatient and start clicking like mad? Revenge trader. If you have a string of wins, do you get fearful and hesitate to click more? Using the hidden distribution mode can simulate what it’s like to start trading a new system. You don’t really know what actual outcomes you are going to get when you start. In the markets, there is no set “true” distribution. The odds are always changing. But this simulator can give you practice in coming to the decision to stick with a system or bail on it, as well as a feel for how many trades it takes to get a reasonable level of confidence in a system’s viability. For the chronically conservative, this can give you practice at sticking with a well reasoned concept even if you see a string of losses right out of the gate. Then you should be able to get over the hump instead of going back to the drawing board and tweaking setup parameters ad infinitum looking to filter out all losses. 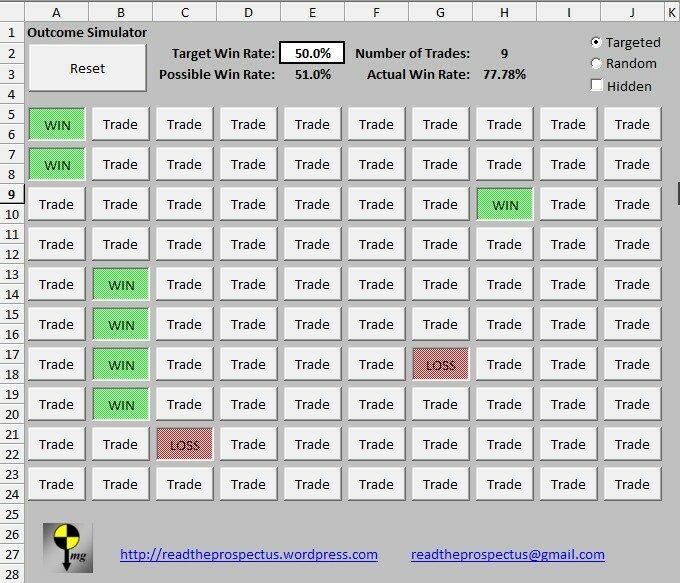 This tool is more about training your brain and emotions than predicting or modeling the markets, which I would argue is the most important foundational thing to do before any trade system work. Of course, the emotional side of being wrong is not really present in a simulation. I can arrange for you to pay me every time the tool beats you if you need me to 😉 But seriously, if you do this enough times, it can help condition your mind to think this way and accept outcomes as they happen under your larger system goals. This tool is freely available under “Released Tools” at my Google site. If you feel this is valuable to you, please consider a donation to my blog. In trading, Greed and Fear are often condemned by many people. Greed is thought of as a companion of Fear, and both are considered to be bad when found in traders. I want to propose a different way to think about Greed and Fear. I agree with Mr. Gekko, that Greed is good, and I will go even further to add that Fear is good, also. However, they are only good for you if you are greedy and fearful of the right things. Otherwise, they are vices and not virtues. A mindset of maximizing my profits (or winning trades) and minimizing my losses (or losing trades) right now on THIS trade. This mindset is focused on the outcome of the current trade. I believe that an outcome-based mindset (whether it’s P&L focused or win/loss focused) is where Greed and Fear cause us to fail as traders. The flipside is that this same mindset is also the source of profit for many successful traders, as they fade the losers.